The Rainbow Crystal foundation papers and strip piecing processes were designed by Quiltworx. The blocks in this quilt require a combination of paper piecing skills, strip piecing skills, and traditional piecing skills. 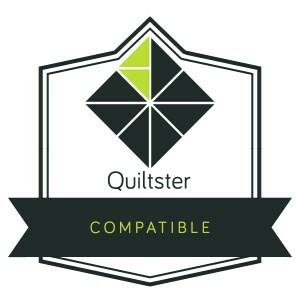 There are no Y-seams or curved piecing, so it is a relatively straightforward quilt pattern that would work well for a beginner to intermediate quilter. The quilt uses 2-1/2” strips and the cover design was created with the Prismatic Strip Set designed by Judy and Judel Niemeyer, manufactured by Timeless Treasures. It uses (1) package of 2-1/2” strips, then (8) accent colors that mimic a rainbow, and black and white background fabrics. The block is used in a 91” x 91” layout that includes (48) diamonds. You've added Rainbow Crystal to your cart!